Cart abandonment! It’s every e-commerce store’s nightmare. Unfortunately, hellish as it seems, it’s also unavoidable. In fact, it’s a part of the sales cycle. A big part too as research has shown that on average, 68% of filled carts are abandoned at check out. This means for every $100 of “ready money”, most online stores get $32. This number is steadily increasing. According to Listrack, a shopping cart abandonment monitor, the 6-month average abandonment rate at the time of writing this article was a whopping 77%! Frustrating? That’s an understatement. Especially after all the hard work of creating your sales funnel, watching the prospect flow through it and only to have them drop off at the finish line. 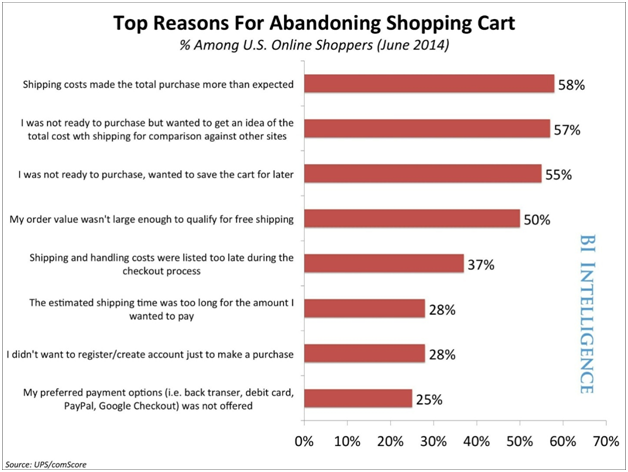 Despite these disheartening cart abandonment statistics, you can improve yours. Your sales funnel is the whole process you take to make a sale. From the landing page to the cart page, the entire system has to be a well-oiled machine. Due to the complexity of the sales funnel and cycle, I will only highlight a few of the major pitfalls you need to take care of. Here’s a simple checklist to get you started. Split Test to see which pages convert better. Especially for single or multi-page checkouts, test which one works best for you. Now that you have ensured that your funnel is as tight as an oyster, let’s look at 7 strategies that can help you improve your cart abandonment rates. No one likes to be unpleasantly surprised. This is the feeling most shoppers get when they are presented with unexpected costs at the checkout page. They will drop your cart like a hot potato. Just take a look at the image below. Unexpected costs are the biggest contributor to cart abandonment. Research by Statista has shown that 56% of shoppers abandon their carts due to “unexpected costs”. The flip side of the same research implies that displaying all your costs upfront actually reduces cart abandonment. People want value, trust, and honesty. Surprising a customer with extra charges at the end of the sales process indicates dishonesty. They won’t know if they are to expect some other nasty surprises from you in the future or not. Openness with all your charges is the simplest way of improving your cart abandonment rates. Revisit your pricing and make amendments. Show all costs on the product page. Include the full breakdown where necessary. As much as possible, include any service charges the payment processor may charge. For example, PayPal charges a $2 processing fee. Let that be one of the expenses you include when determining the price of your product. Not all who purchase from your site are willing to be regular fans. Some just come because of a good deal you are offering or a specific product. Registering will become a big deterrent for this type of customer. Because they don’t really know you, they may not feel comfortable giving you their details. This is where the guest function comes in handy. It, in fact, is the perfect way to kill two birds with one stone. Bird number 1: It helps you make a sale. Bird number 2: It provides you with an opportunity to earn the customer’s trust. From the onset of the customer journey, give your prospect the option to register or to continue as a guest. The ideal would be to have the options on the same page. A good example is the Walmart screenshot below. Not having a guest check out is a sure recipe for high cart abandonment rates. Set up your store in a guest friendly way. Give guests an experience that will force them to be regulars. For those who opt to check out as a guest, make a provision for them to register after they have made the purchase. A simple ask is all it takes. Since billing (and shipping in some cases) information would already have been filled in, ask the customer if you can save their details for future convenience. The only step they will need to take will be to create a password. Don’t force customers to register before checking out. It increases the friction between you and the prospect. Politely ask to save customer details at the end of the transaction. Make it about the customer’s convenience, not yours. In this age of cyber insecurity, online shoppers need to know that your site is secure. They need to know that their information is safe with you. The best way to do this is to get the best internet security solution on your site and display the badges of your security provider on your site. Especially on the checkout page. Security is a big issue, especially for first-time visitors. When they see proven and trusted “safe” signs in the form of security badges, they become more confident to share their information with you. Making a sale becomes easier. 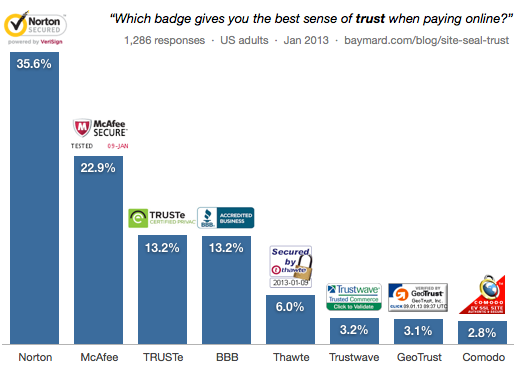 The bigger the security brand, the more confidence your site will gain from prospects. Displaying these security seals does more than add colour to your site. These seals prove to the customer that you take security and their privacy seriously. For an in-depth tutorial, visit your security provider’s manual. The bottom line is that your e-commerce website cart abandonment rates can be vastly improved by investing in security. Gain the trust and confidence of your customers by displaying trust seals. If conversion and sales are a big issue for you, take security seriously. Using a well known and trusted security seal gives you more credibility. 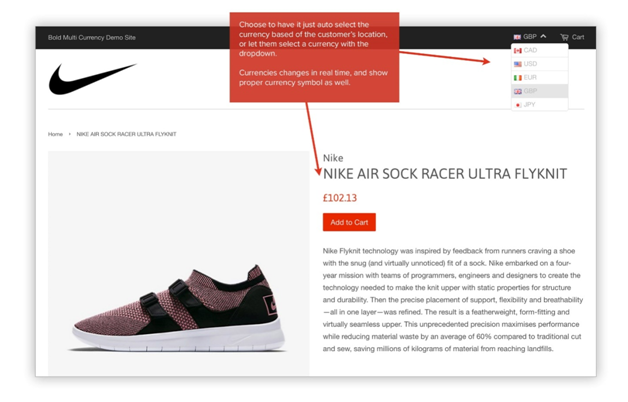 This may seem like old news but many e-commerce stores fail to properly do this. Google’s mobile first should actually be happily embraced by all e-commerce stores. Why do I say this? Because it gives you more opportunity to reach customers as they take their mobile devices everywhere. “The combined traffic from mobile and tablet devices tipped the balance at 51.2%, vs. 48.7% for desktop access, marking the first time this has happened since StatCounter began tracking stats for internet usage.” Tech Crunch. 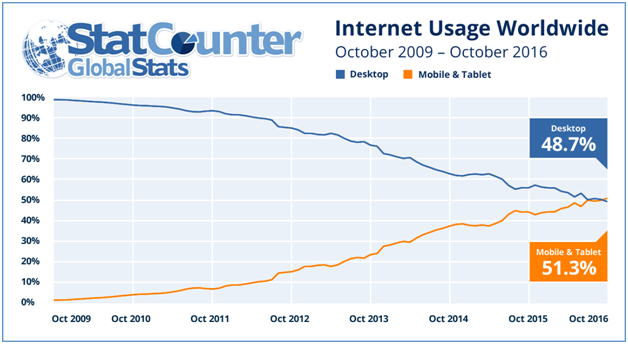 People are spending more and more time on their mobile devices as compared to their desktop devices. What does this have to do with improving cart abandonment rates? If your website is not optimized for mobile, you are automatically losing out on 51.2% of your customer base. 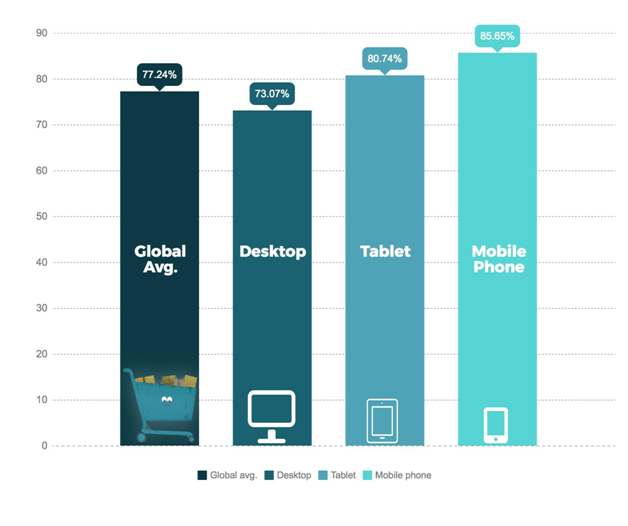 Apparently, cart abandonment is higher on mobile devices than it is on desktops. Why the disparity? Online sellers are taking their time to optimize for mobile. Most shopping is being done via mobile and if you miss this piece of the pie your abandonment rates will go through the roof. The days of pinching webpages to resize them are long gone. Have mobile responsive sites otherwise, prospects will end up ignoring you all together. Don’t frustrate your customers. If it’s mobile they want, give them mobile. And don’t worry, it’s as easy as ABC. Is My E-commerce Store Mobile? Brilliant question! In order to find out here are a few tests you can carry out. View your site on multiple mobile devices. How do your content, images and form fields look? Purchase some products using a mobile device. How is the experience? Check out your site using different browsers. Does it load properly? How Do I Make My E-commerce Store Mobile Friendly? Use a mobile responsive theme for your website. A responsive theme is one that adjusts itself to fit the screen size it is being viewed on. Add mobile plugins to your CMS platform. A plugin is a piece or pieces of code that extend the functionality of a website. Examples of good plugins that aid in making a website mobile friendly are Jetpack (WordPress), JoomlaShine (Joomla) and ThemeKey (Drupal). Go for an e-commerce platform that supports mobile. Optimizing your e-commerce store for mobile will definitely help in improving your cart abandonment rates. If you haven’t yet optimized, do it now. Running an eCommerce store or any online business is next to impossible without the use of forms. The downside is that prospects don’t like filling in forms. Optimize your forms. Strike a balance that will not deter the customer and yet give you all the information you need. There are three simple ways to help you do this. Make the form short and sweet. Long forms are a major pain point for online buyers. Don’t ask the customer for unnecessary information. If you don’t need their phone number don’t ask for it. Design the form in a way that is easy to understand and fill. Colours and images play an important role here too. Important information should be marked with an asterisk so as to ensure the customer doesn’t skip that field. Instead of asking the customer to type in information, have a form where they can click on relevant information that pertains to them. For example, if you need a date of birth, include a form where they click on their date of birth on a calendar. Is your form optimized? Or is it a contributing factor to your cart abandonment rates? 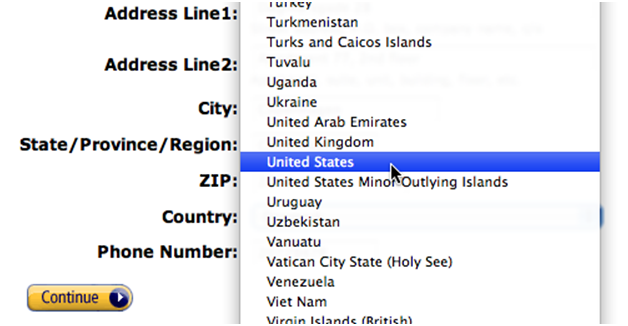 Get rid of all unnecessary fields on your forms. Give your forms an aesthetic and appealing design. One thing e-commerce merchants hope to be is global players. That’s the point of going the online route as opposed to the brick and mortar way, isn’t it? And yet when it comes to payment, they make global customers work hard by calculating exchange rates. A survey by Statista revealed that 13% of online shoppers abandon their carts due to a site failing to display prices in the customer’s local currency. To be successful online, you have to reduce friction between you and the customer as much as you possibly can. Providing an option to check your prices in other currencies and pay in them is a major way of reducing friction. Not only does paying in a local currency reduce friction on the customer’s part, but it also reduces the risk of chargebacks on your part. The benefits of allowing payments in multi currencies are so many they can’t be covered in this post. But the biggest benefit is that your customers will feel at home shopping with you. This will definitely reduce your abandonment rates. Offering your customers their choice of payment method and currency is a guaranteed way to help you improve your cart abandonment rates. 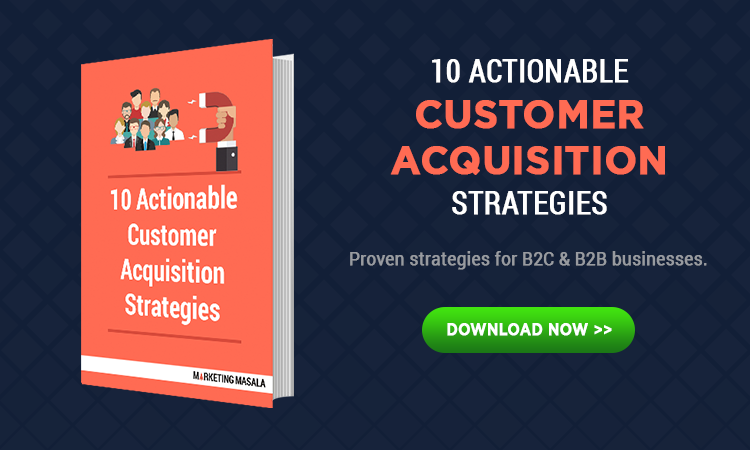 Go ahead, implement this strategy and reap the profits. Quoting prices in a local currency keeps your customers focused on the purchase. Picking a calculator to convert will just be another distraction that will lead to an abandoned cart. A multi-currency gateway will give you a competitive advantage. If a cart has been abandoned, don’t lose heart. There is a way to turn that abandoned cart into a solid sale. Some carts are abandoned, not because the customer was not ready to buy, but because they got distracted. Let’s face it, distractions are all around us. Other times a cart gets abandoned because the customer is still researching the product. The list can go on and on. This is where remarketing and retargeting come in. Although these are not preventative measures, they do help bring back defaulters, thus improving your cart abandonment rates. Though these two tactics have different names and mediums through which they operate, they both have the same objective: bringing back a lost prospect. Let’s briefly define these two. Remarketing involves following up a prospect related to the product they abandoned. 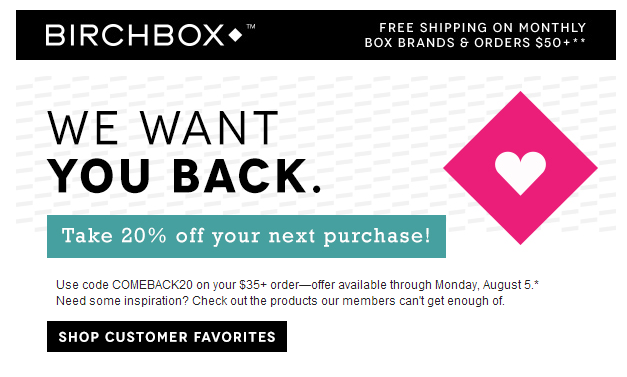 It could be a friendly reminder to continue with a purchase or better yet, a discount offer on the abandoned product. Remarketing is all about marketing your product over and over again to a prospect. This can be done via email, social media, phone and even billboards. When it comes to cart abandonment, email works best. It’s simple logic really. If you have access to a person’s inbox, why not send them a friendly reminder of the cart they forgot? 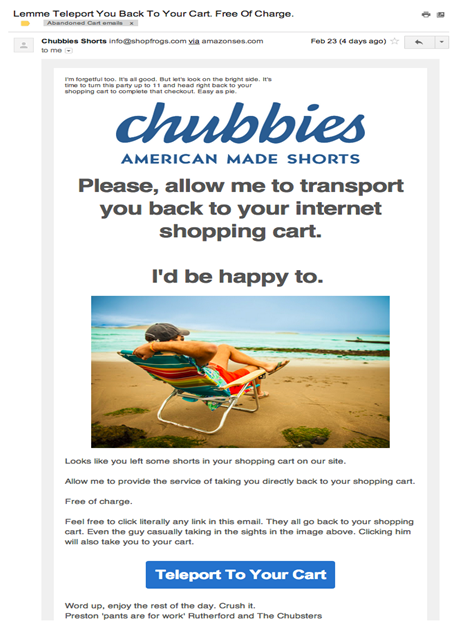 Here’s a classic cart abandonment remarketing email from Chubbies. Research has shown that it is more profitable to send a follow-up email within the first hour after a cart has been abandoned. In fact, a delay of more than an hour reduces your chances of re-engagement 10x! Time really is money. This part is about remarketing an abandoned cart through social media. And the undisputed king of remarketing via social media is none other than Facebook. Let’s take a brief look at how to recover lost carts through Facebook remarketing. #1. Log into your Facebook Ads Manager and select the “Tools” drop-down. #2. Select “Audiences” and create your “custom audience”. These are the specific type of people you want to target in your remarketing campaign. For example, we want to remarket to those who abandoned their carts. This is our custom audience. #3. Using your defined audience, you then create a pixel (tracking code). This will tag and follow customers who abandoned their carts back to Facebook. Facebook also gives codes for specific actions on site. Let’s say someone adds an item to their shopping cart, Facebook will give you a code for that. You can then select those who added to cart but didn’t complete the transaction and get a tracking code for them. 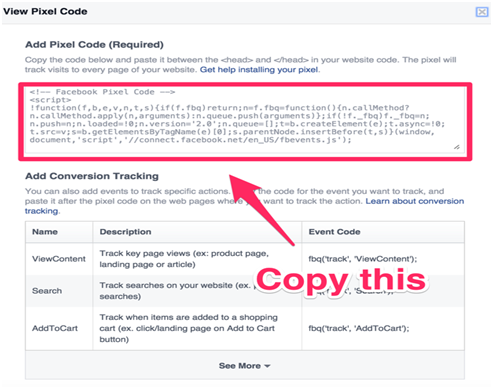 Paste Facebook Pixel into the header HTML code of every page on your eCommerce store. Once the pixel is live, it will inject your ads into the prospect’s news feed. Your product will constantly be in front of them so to speak. More often than not, they will go back to the abandoned cart and complete the purchase. Retargeting refers to the strategic placement of ads based on the prospect’s activity on your site. In the case of cart abandonment, the ads should relate to the product the prospect abandoned. Using cookies to follow the prospect around the web, these ads serve the purpose of reminding the prospect of the abandoned cart (and enticing them to complete the purchase). From your AdRoll dashboard, copy your AdRoll pixel and paste it into the HTML of your website. This is what will track your website’s visitors. When you are ready with your ad, you can upload it to your first campaign. Otherwise, save it in your Ad Library if you want to wait for a specific time. 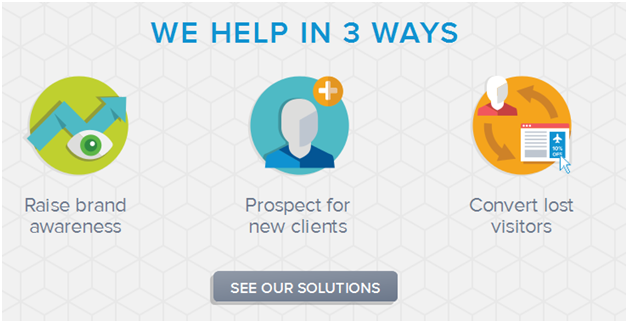 If you don’t want the hassle of designing your ad, AdRoll has a design team that can do it for you. All you have to do is provide them with the necessary information. This is where you choose your “target”, budget, schedule and medium for your ad. Unlike AdRoll, Chango doesn’t need anyone to visit your website. They offer search retargeting. This simply means they target customers based on their recent search history. Using data from their network, they place your ads in front of a prospect who visited a site relevant to your product. The downside with Chango is that it is expensive for those who are just starting out on the e-commerce journey. Their minimum price for a campaign is $10k. Depending on your budget and target audience, the choice of tailor-made retargeting solutions is vast. So, between remarketing and retargeting, which strategy should you use in re-engaging your prospect? The answer is simple. Both. Whatever information your email or ad will contain, their basic purpose is to re-engage the prospect and prod them to complete the transaction. Don’t give up on abandoned carts. Launch a remarketing campaign to woo back your prospects. Use retargeting ads to keep yourself in your prospects mind. Ready To Get Those Cart Abandonment Rates Low And The Profits Up? Abandoned carts have a total value of $4.6 trillion. That’s a lot of money to leave in a basket. With the strategies outlined above, you should be able to regain your piece of the $4.6 trillion pie. Remember, improved cart abandonment rates mean your customers are happy with your business. And happy customers equal higher profits. Now that’s a win-win situation. Kato is the Chief Content Strategist at bizcontenthub.com. A strong aversion to bland web copy has set him on a crusade to help you increase reader engagement by crafting hypnotic copy that will turn browsers into subscribers. Let’s get people talking about you.